Happy Monday friends!!! When you have two early morning flights on both sides of the weekend the above picture could not be more true! You might have seen from my Instagram that Gary and I were away in Maryland this weekend for my good friend's wedding!! Here's how we spent 36 hours away! The flight from Boston to Baltimore is really quick, so we were in Annapolis by 9:00 AM!! What do you do when you've never been to a city? Obviously a guided tour with a colonial twist! We stopped into the visitor center planning on sightseeing on our own, but when Gary from Colonial Tours of Annapolis told us to join him for a tour we obliged!! He absolutely blew us out of the water with his knowledge and it was well worth the three hours we spent walking through Annapolis. It reminded me of a smaller Newport or Charleston - lots of cute shops, right on the water & really nice people! //Toured the state capital and got my Elle Woods moment sitting in a Senators chair! If you find yourself with only a day to spend in the city I cannot recommend this tour enough!! Our guide also recommended Chick and Ruth's which is a staple in the Annapolis community!! It's been on Man vs. Food and it just the quirkiest little deli ever!! Their known for their crab cakes and that's obviously that's what we had! After spending the day in Annapolis we headed to Kent Island where the wedding would be taking place!! We were lucky because every fantastic seafood restaurant was across the street from us! We went to Bridges on Friday night! So I was slightly disappointed when I was told they were out of the soft crabs which I saw on Yelp as the meal to get, but the waitress suggested the crab tie pasta which satisfied my craving!! The restaurant has amazing views of the water and it felt like we were really on vacation! Another bonus is taking advantage of happy hours since we don't have any in Boston! After spending the morning at the Queenstown Outlets - props to my friend for having her wedding so close to shopping - we went to The Jetty! For all my Maryland friends, if you haven't been here yet, please go because you will feel like you're on an island vacation!!! Shocker...we opted for the soft shell crabs again and it was AMAZING!!! 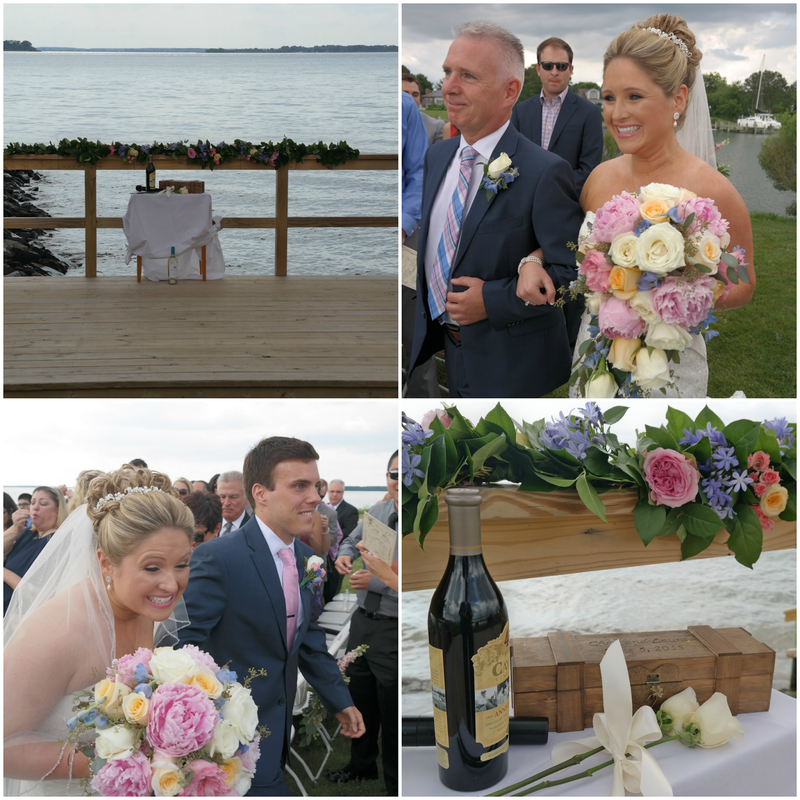 The wedding ceremony took place overlooking Chesapeake Bay and thankfully the sky held out and waiting to rain until all the guests, bride & groom were safely in the reception!! I'm not sure I've ever seen a happier bride!! Laura was beaming all night as was her new hubby! They actually did something so special during the ceremony - they wrote letters to one another and sealed them in a box along with a bottle of wine that they will open on their first anniversary and then repeat for every anniversary to follow! //With my forever date! I had a few people ask about my dress and I got it from Mint Julep Boutique, but found it online here if you don't have a Mint Julep near you. I was on the hunt for the perfect summer wedding dress and I seriously could not have been happier when I found it! I also wore my Sole Society 'Lindsay' heels (still on major sale) which I managed to survive in for the majority of the night! I had the best time reconnecting with my friends from college and while it's sad we don't get to see each other that often, it's nice to know that we fall right back into our groove just like in college!And just like that the wedding was over and it was back to Boston!!! Not to worry since we have another wedding this coming weekend!! Tis' the season right!? 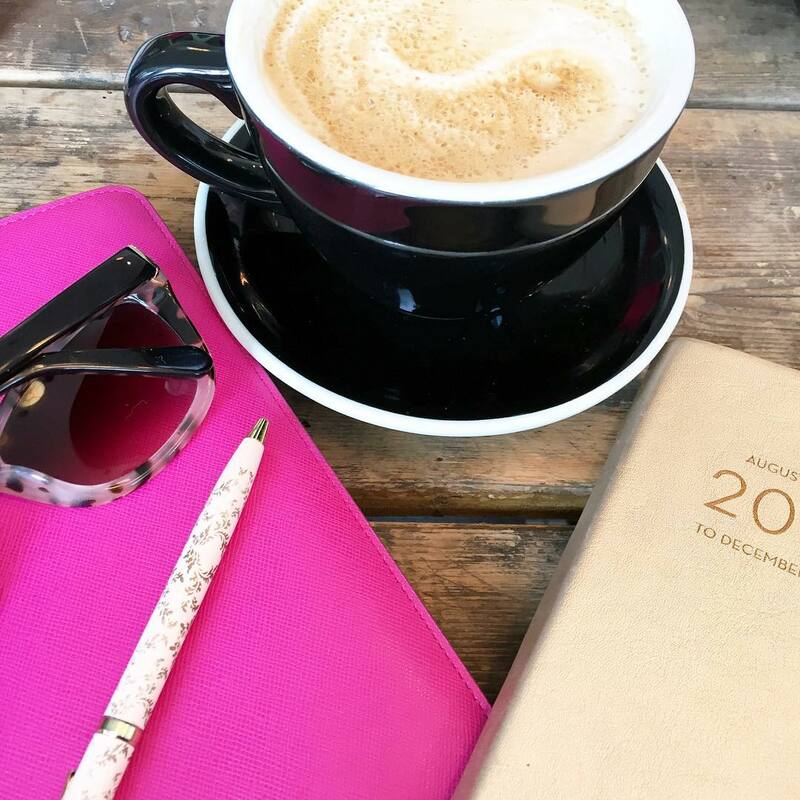 Hope you all have a wonderful start to your week and link up below to share your weekends! Looks like you had an amazing time, lady! I'm glad you were able to find fun things to do. One day we will get our blate. ps.com love your dress at the wedding, so pretty! Have a fabulous Monday, gorgeous! Hope your Monday is as great as your weekend was!! Looks like such a fun weekend! You looked beautiful at the wedding! Yay! Glad you had such an amazing time at your friends wedding! Isnt it great getting to hang out with people again and just fall right back into place where you left off? Thats how you know you have a great friendship! Can we just talk about how gorgeous you looked at the wedding?! Didnt anyone ever tell you that you arent supposed to look hotter than the bride?? :) Happy Monday love! Looks like so much fun! I loved the dress you wore. That color is awesome on you. I wonder if I could wear that color lol. The wedding cake and cupcakes were so pretty! 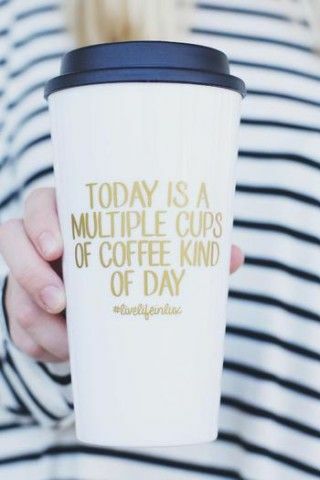 xo Happy Monday and it is a multiple cups of coffee kind of day! I have to get my house back in order I was soo busy last week! Such a fun weekend! Baltimore is a great city. My hometown is only about 90 minutes away so we used to travel there often. Your hair looked fabulous at hte wedding and I love your dress! Looks like y'all had such a great weekend, jam packed full of fun out of town things! Annapolis sounds like a great town to visit someday. Hope you have a great week! ahhh! fun. first off, you and Gary are just adorable, I can't even. the bride looks beautiful and so happy, always a plus! your dress is absolutely gorgeous, the colour and cut is just so flattering on you!! I’m headed to Baltimore for my close friend’s wedding in September! Bring on all the fresh seafood. You looked beautiful at the wedding! Looks like a fun weekend!! That's awesome that you got a great tour to begin your trip!! Laura looks so gorgeous!!! Those flowers are amazing too!!! Yay for long weekends, friends, and love!! Oh girl... yellow on you! YES! & your hair. My goodness - gorgeous! What a happy beautiful bride! 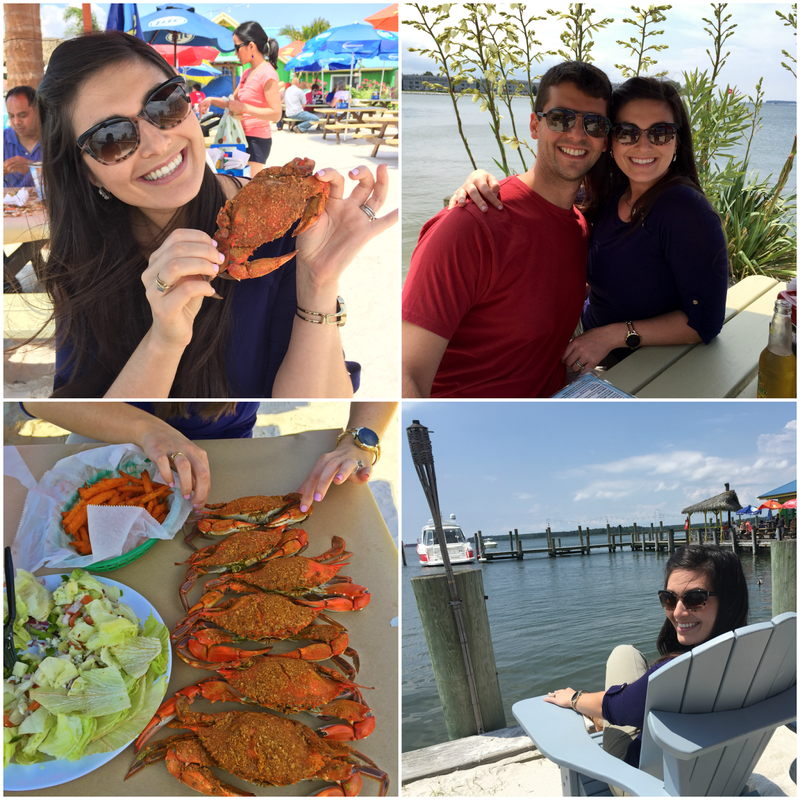 All wedding fun AND lots of seafood - perfect weekend! oh i love annapolis! what a quick trip but you crammed in a lot! so fun. and what a gorg bride. and well you two. duh :) give me all the MD crabs please yes! and i'm a little hung up on the lack of happy hours in boston. boston and i may need to have a talk about this. ha. Love the pic of you & Gary at the wedding! So weird, one of my BFFs lives on Kent Island. I never hear of anyone going there. It's a nice place to visit! I'm glad you guys made the most of it. Those pictures are so amazing! I just love the Chesapeake area. Your lace dress that you wore to the wedding was so adorable. You looked great! Oh that is so lucky the weather held out until after the ceremony! I feel like it's been raining even if not predicted lately. Crazy weather, or I'm just getting bad information. Anyway, I am so jealous of those delicious looking crabs you got to eat. Annapolis looks adorable! Totally stalked all of your pictures on Facebook last night! Maryland looks so gorgeous! Definitely want to visit now! Those crabs look so amazing and I'm absolutely in love with your dress from the wedding! So pretty! That looks like such a fabulous weekend! Bride looks so happy and a wedding overlooking the sound, ah! I've never had crab like that and it kind of creeps me out but I love lobster when it's just a portion of it but to look at it whole I don't know if I could do it!! Love that dress, perfect for Summer and that pic of you guys is perfect! Such a fun weekend! I love Annapolis so much! My sister in law and her family used to live there and I loved visiting! The crabs are outrageous and the historicalness plus the seaside make it such a beautiful spot!! What a fun little weekend getaway! I LOVE your dress - you looked gorgeous! First, I am obsessed with this coffee mug. And it's super appropriate for me today! 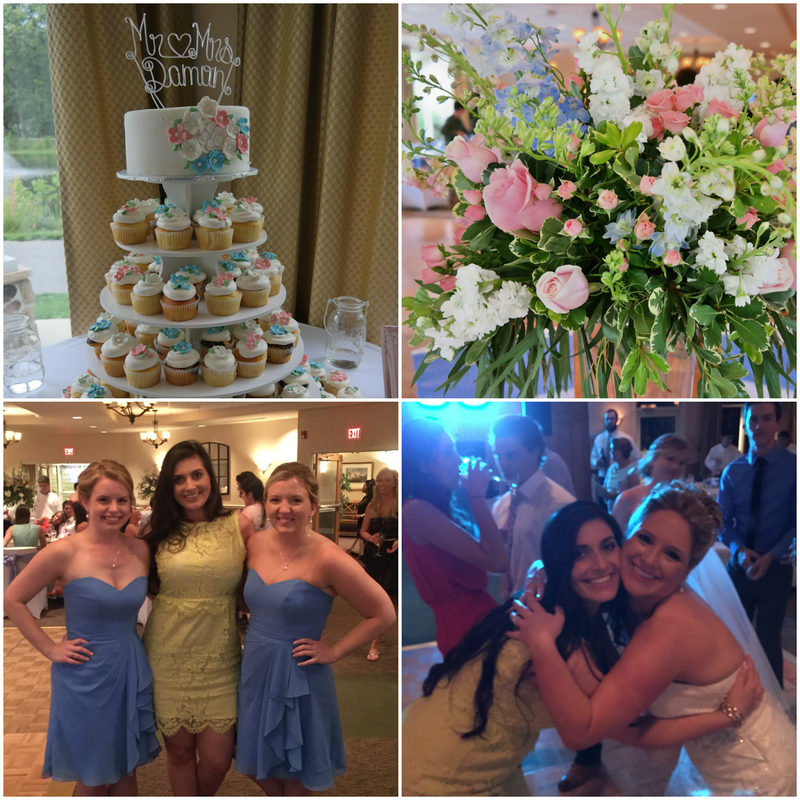 Sounds like you had a great time in Annapolis and the wedding looked beautiful! 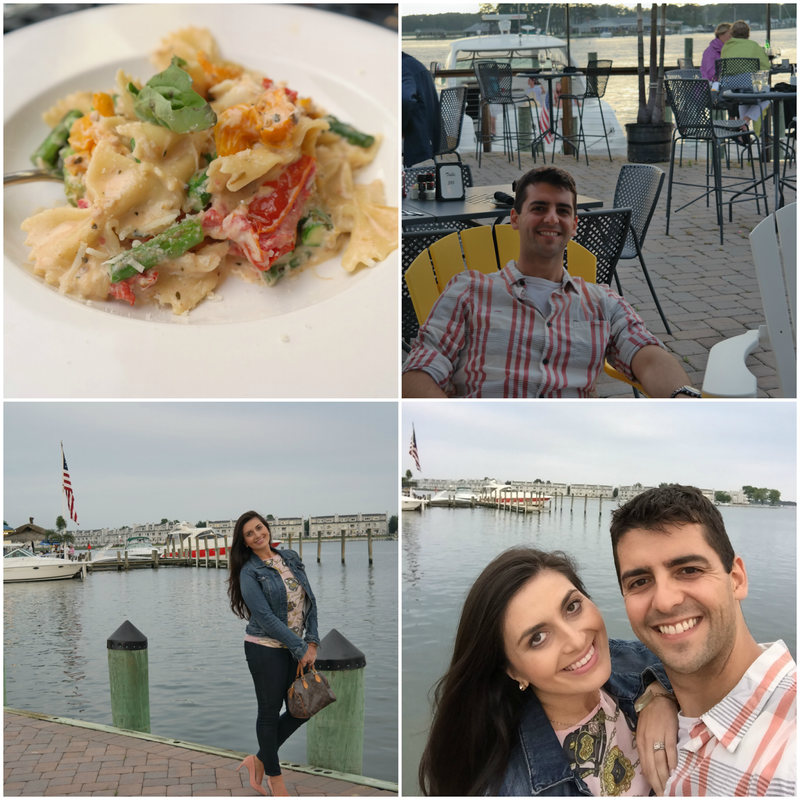 We love taking day trips to Annapolis since we live outside of DC -- you were so close to us! haha Happy Monday! What a fun weekend. I so need to visit Annapolis, looks like a fab little town with tons of history. My kind of time. You looked GORGEOUS and can we talk about how perfect your hair is!! I wish I was blessed with such great hair. I had no idea it was so pretty there! Looks like a fabulous time! Love the brides flowers, too!! What a fun little getaway, I've never been to Maryland, but that area looks gorgeous especially being right by the water. What a beautiful wedding too, she definitely looks like a happy bride and your dress is gorgeous! Looks like a beautiful wedding and a fun time! Love the dress your wore to the wedding! Looks like a fun (but fast) trip! Omgsh that dress you wore to the wedding is to die for!! I am in love the the laser cut out look and the color!! Looks like you had a blast :) Short and sweet!! That a fun weekend! PS that mug is definitely one I need! I'm a total nerd for guided tours! That city looks gorgeous. Glad you enjoyed the wedding and the time reconnecting with friends. You guys packed in SO much fun on this little getaway! I totally want to go there now! What a beautiful town! And of course you look stunning in all these pictures!! How gorgeous is Annapolis? Holy cow! The buildings! THE HISTORY! LOVE THIS. And the bride and groom look so happy! Thank you for sharing this amazing weekend! gorgeous gorgeous! Love all the photos! What a fun getaway! What a fun weekend! I remember Annapolis being such a cute town, and I bet all that soft shell crab was delish! You looked gorgeous at the wedding, too- love the dress! 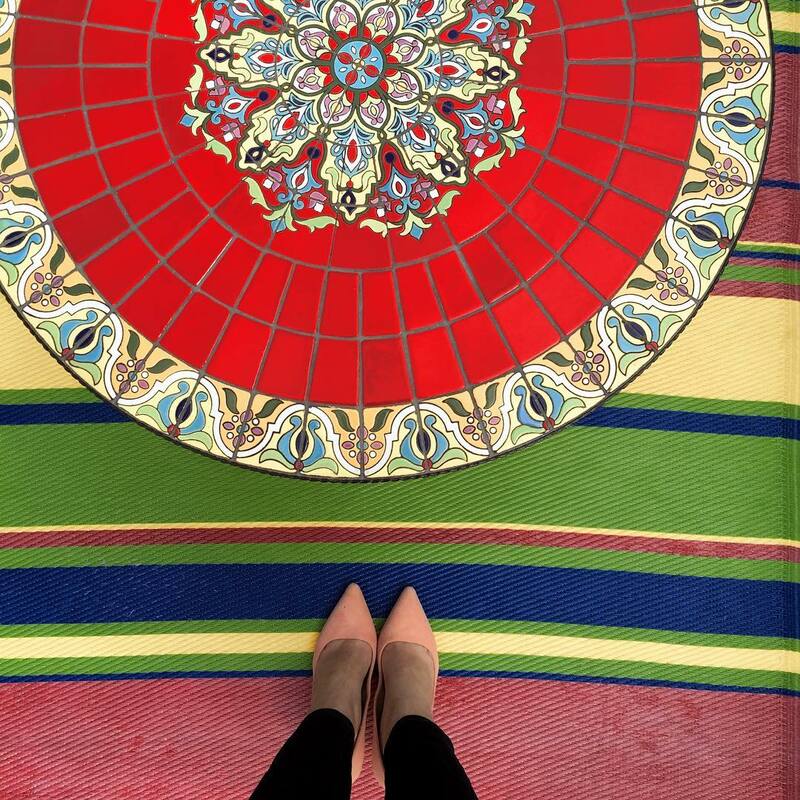 Looks like you had a beautiful trip girl! I haven't been to Maryland in forever but it looks like such a great time! Now I have Wedding Crashers quotes of crab cakes and football in my head hahahaha. That dress is perfection on you! Love the color of it! I loved following along on your insta! It looked like the perfect weekend. I am totally jealous of all of those crabs - they look delicious! Love, love, love the dress you wore to the wedding too. What a fun weekend! I love weddings! I haven't been to one in a while...we're in the everyone is having babies phase! Looks like a perfect weekend away! I love all the time you guys got outside and happy hours - that's crazy that boston doesn't have any! I love what they did with the wine and letters at the reception - that is so sweet! What a fun weekend!!! I'm sometimes jealous of east coast life! It's so easy to pop in and out of different cities because of how close everything is! I'm definitely going to need to check out this shop! I need a few new dresses for summer! I live in DC but I want to try The Jetty! How is it that you don't have ANY happy hours in Boston?! I love your dress! What a beautiful wedding! I'm so glad you had a good weekend! This looks like such a charming town! And those crabs are out of this world! What a beautiful bride -- she looks so happy! What a fun little trip! 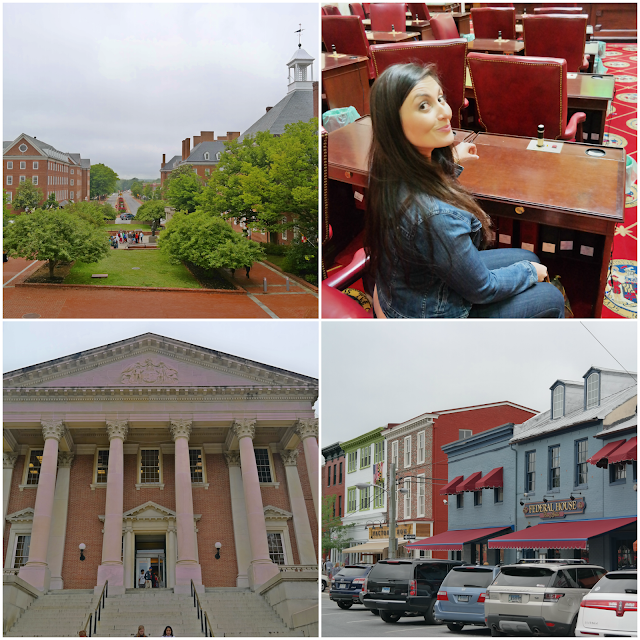 Annapolis is so pretty, we visited briefly a couple of years ago when we we're visiting my SIL in Baltimore! ALL OF THE FOOOOOOOOOD!!!!! You looked gorgeous at the wedding!!! Love your hair and dress. What a sweet idea with writing letters and placing wine in the box. That is so special :) Sounds like you had a great trip, it looks like a fun town to visit. Have a great week! Gosh Biana, your weekends always look so much fun and just really so adventurous! wish I had as much fun as you do on the weekends, what fun and delicious weekend. Such a gorgeous wedding and so much amazing food, we are definitely hungry now. Sounds like another totally amazing weekend! The letters in a bow...what a sweet idea! Love your hair and your dress! What a great little getaway! 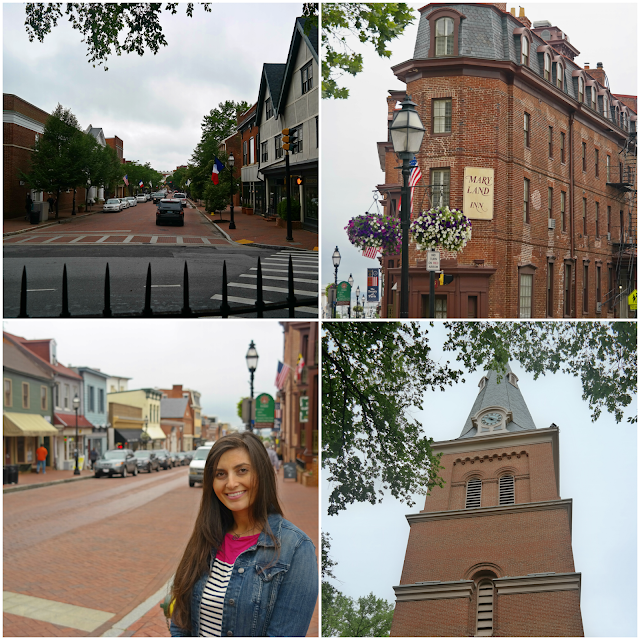 I have been wanting to visit Annapolis for quite a while and it looks so pretty there! You look great for the wedding, I love your dress! I loved your wedding look! I've never been to Annapolis but it looks like such a fun city! Love it! I was just thinking this weekend how much I'd love a crabmeat roll! The pasta looks just as tasty though! Seriously..could this weekend recap be any cuter? So many frame-worthy pics here! Absolutely beautiful! That first picture about it being a multiple cup of coffee day couldn't be more true! Your friend makes a stunning bride! Congratulations to her and her new hubby! Loving that yellow dress on you! SUCH a fun getaway, always so great to celebrate a wedding and get a little trip from it! you are flawless and i love your dress!!! What a fun weekend you had! It is always great with a destination wedding when you can add your own fun and make it more of a get away then just a wedding! What a fun trip! I'm in love with that yellow lace dress on you! What beautiful pictures of you and your forever date (which is the cutest name ever! ), you seem like you really made the most of a weekend away! And your dress is so pretty, so perfect for a summer wedding! So fun!! I love doing tours of new cities- and of course eating at all the fun/new places too ;) What a beautiful bride - so happy indeed. And YOU my friend are stunning in every photo!! Looks like a wonderful time! I would love to visit. You looked just stunning at the wedding! Wedding weekends are the best, aren't they? Especially when they're in a fun city you can explore! Your hair looks fab and I love your bright-colored dress! I don't usually like crab (strangely, I like imitation crab), but that pasta looks good. Love that yellow dress on you... soooo pretty! That tour sounds like so much fun! And yay for weddings - this sounds like a perfect weekend! You looked gorgeous this weekend, Maryland looks so cute!! Looks like you guys had such a great time, the view from that restaurant is gorgeous! Ohhh, love Annapolis! You're totally right, it's like a smaller Charleston. Every time I've been I've had a great time, and it looks like your trip didn't disappoint! Funny fact: I can't say Maryland. I always pronounce it like it looks. Mary-Land. My husband gives me such a hard time about it haha! Your pictures are beautiful! Wow! Looks like you had a jam packed 36 hours! Great photos. That is always my go-to when my time is short in a new city - a tour! What a beautiful wedding! You don't have happy hours in Boston?! Oh man :( We have a ton here! I love getting cheap(er) drinks! :) The wedding looked gorgeous and I love your dress. Love that beaming smile on your friend's face on her wedding day! What an awesome weekend! All of the food looks delicious! And the bride's flowers were absolutely gorgeous!! Tis the season for weddings indeed! Love that yall were true tourists and got out to see the sights. OMG that food looks amazing! What a fantastic weekend!! Your dress for the wedding was gorgeous, and I just love the bride's bouquet! I've never tried soft shell crabs before, but they look really good! i'm with you on taking tours when visiting a new city. what better way to discover a new city?! Fun weekend!! So many gorgeous pictures! What an incredible place for a wedding - and a weekend trip!! Annnd now I'm DYING for soft shell crab! You girls looked beautiful! Loved your dress!! What a fun weekend! I would so love to visit the east coast again sometime! The water view picture is amazing! I cannot believe how much you two crammed into your 36 hours in maryland!! well done! what a cute little town! Love you in yellow! What a cute town (and you know I personally appreciate those food pics). The bride was just gorgeous but hello, her bouquet! Lust-worthy! Looks like a beautiful wedding & fun weekend! Sounds like a great weekend and cute wedding. You got a lot done in 36 hours. That first house (?) is beautiful!